Thank you to everyone who came out and made our 8th Annual Apple Pie Giveaway such a HIT! We love this event as it gives us the opportunity to make new friendships in the community and reconnect with some familiar faces. We look forward to this each year and hope to see you all again next year! Announcing our new AmazonSmile Cain Club Activity! Through Cain Cares, our mission is simple. We strive to help when help is needed most. A severe time of need or a sudden emergency can happen in a blink of an eye. We intend on being that helping hand when there are no other options. Now there is an even simpler way for you to join our mission, at no cost to you! 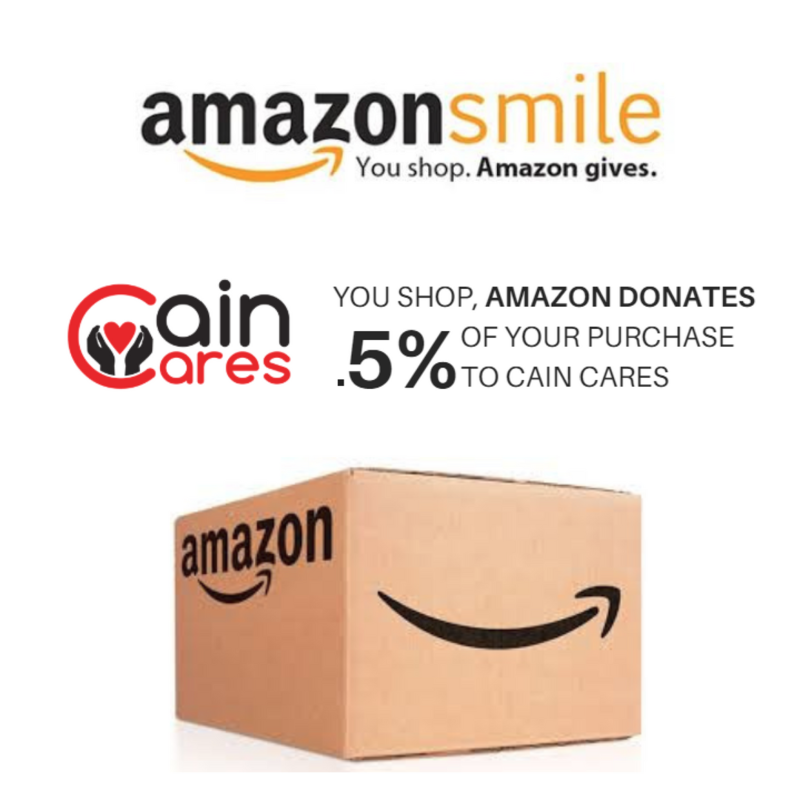 Introducing, Cain Cares -- AmazonSmile! AmazonSmile is a website operated by Amazon with the same products, prices, and shopping features as Amazon.com. The difference is that when you shop on AmazonSmile, the AmazonSmile Foundation will donate 0.5% of the purchase price of eligible products to the charitable organization of your choice at no cost to you. Simply connect your account and start shopping away! Be sure to bookmark the new link, you will need to use Amazon.smile for your purchase to count. We appreciate any and all support to continue serving our clients, past clients, friends, and neighbors should an emergency arise. The donations made from the AmazonSmile foundation in your name will assist our mission of being to help those that need it the absolute most. You can feel confident that Cain Cares will issue blessings to those that could use a ray of light the most. Click here to receive 15 Cain Keys upon connecting your AmazonSmile account! Summer is finally here! Kick-start your summer with a fun-filled schedule of family events and activities. Check out the hottest summer events courtesy of our preferred title company, Texas National Title! Mother's Day is approaching quickly and we want you to be covered, ensuring an amazing day for both you and mom. Follow DO512's Tips on how to have the best Mother's Day ever! Take her out for tea. Check out Brentwood Social House, The Steeping Room, Full English Cafe, the Four Seasons or the Driskill. Go see a show. Snag some tickets to Ballet Austin’s Peter Pan, hear a free Concert at the Capitol by Austin Symphonic Band, listen to a special Mother’s Day Piano Concert at Austin Scottish Rite Theatre, or enjoy Shakespeare in the Park for free on the Zilker Hillside. We have a Big announcement and opportunity for you all to be apart of on Thursday, April 5th from 5:30 to 9:00 PM! Recently, our team has been chosen to be featured on the New TV Show Success in Your City, which is a show highlighting entrepreneurs in different cities that are creating great things in their business and also helping others. The crew is Emmy award-winning, and the producers are the co-founder of Priceline, one of the original sharks on Shark Tank and a producer that worked with the Napoleon Hill Foundation to create the Think and Grow Rich movie. As part of the show, we are filming a big fund-raising event for our non-profit, Cain Cares. At this event titled Think, Do, and Grow Rich, we have the author of the new Think and Grow Rich book speaking and signing copies of the book, as well as myself speaking on how my thinking has changed and how that's impacted my life. A portion of this will be me speaking about how BOLD has lead to me thinking at a much higher level. There will be other speakers and also a panel discussion. All the proceeds from the event and everything we do will also go towards our 1st Annual Love Where You Live Event, the following Saturday. This event will include our entire organization, along with any applicable service providers, essentially shutting down for the day to go and work as a team to improve a resident's home and property. By the end of the day, we will have made a new friend, and their home will once again be a place of happiness to help them along through their tough times and challenges. Every year, Cain Realty Group rewards one very lucky Southwest Austin resident with a custom exterior holiday lighting package from Dennington Decor. It's one of our favorite events we put together every year, and we love showing up at the winner's doorstep to surprise them with the fantastic news. We begin accepting entries in November every year, and we usually surprise the lucky winner the first week of December. Residents can only win once, so make sure you fill out the entry form below to throw your name in the hat. Click here to fill out your entry form!